This is a cost-effective solution to SMEs and start-ups, offering a range of office configurations along with a full complement of business support services. This is a very convenient location, close to Watford Junction train station, where there are regular services to London Euston, and a short drive from the M1 and M25. This space is accessible 24-hours a day, great for flexible working hours if required. Architecturally impressive business premises with extensive facilities including support staff, high tech systems, kitchen areas, a relaxing terrace area and car parking. The office space is spread over 4 floors and the property is situated minutes’ from Watford Junction mainline station which has fast services into London. This brand-new business centre has recently been refurbished to a high standard, and offers a variety of serviced office solutions to suit businesses of all sizes. Conveniently located close to Watford Railway Station and the local shopping centre, London Euston can be reached easily with frequent, fast services. The centre has parking spaces, ideal for tenants and visitors and the on-site management team are on hand to help with any queries. Perfect for small and medium companies as well as individuals, this property presents a varied range of bright, professional offices spaces and warehouses with access to meeting rooms, showers and parking. Virtual Office arrangements are also offered. The site is in the North Watford area near to rail services, bus routes and shops. Modern, spacious and flexible office solution for your business. With both private serviced offices and co-working spaces available, this listing has the perfect office space for you. The office building is located in a well established business park setting and is situated in stunning landscaped grounds. There are meeting, conference and training rooms available for tenants to take advantage of. Situated in easy reach of motorway networks, a bus stop and Morrisons Supermarket, this office space has everything you could possibly need. This office space is in a very accessible location, with a bus stop and train station located in close proximity. 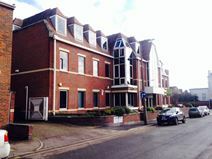 The work centre offers modern and flexible co-working and serviced space in Watford. The building offers plenty of natural light and it is located on landscaped grounds. There are many excellent facilities such as 24 hour security, meeting rooms and a winding staircase. The centre has lots of local amenities such as a Morrisons and a cafe located within walking distance. This property is situated on Dwight Road approximately 2 miles from the centre of Watford. This is a highly accessible location, just 5 minutes from the railway station. 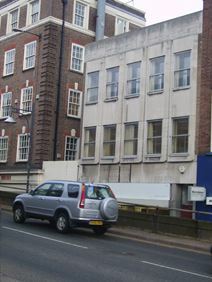 Office space is available on the first floor, along with toilet, shower and boardroom. The space can be adapted to suit the needs of the client. This centre provides office space that has recently been refurbished to a high standard, the spaces come in a variety of sizes and are great value for money. Tenants have access to the property 24-hours a day, perfect for those who work outside the regular nine-to-five. There are kitchen facilities on-site as well as street parking. Watford and Rickmansworth are equidistant, both offering fast and frequent rail services into London and beyond. 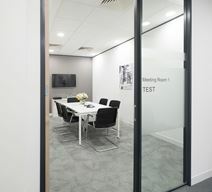 Offering all-inclusive pricing with no unexpected costs this modern business centre provides a range of meeting rooms and offices that are ideally located just 20 minutes from Euston Station by train and 20 miles from Heathrow Airport. A modern office working environment located just off the M1. Only 20 miles from Heathrow or 20 minutes from Euston station, the space is perfect for business travellers and mobile professionals alike. Enjoy the drop-in business lounge that boasts high-speed wifi or take a break in the individual breakout areas. Alongside this you'll find bookable meeting rooms, reception services and administrative support. There is also 24 hour access and security at the office to ensure you work on your own flexible terms. Close by there are an abundance of shops, restaurants, bars and cafes, so you'll never get stuck for something to do! With plenty of green space nearby, take a brisk 30 minute walk into Watford city centre and enjoy what this great city has to offer. Situated in the heart of Watford, this flexible office space is available on short or medium term agreements, with no hidden expenses and the benefit of onsite car parking. The versatile space can be adapted to suit, whether it is for single occupancy or for fifteen workstations or more. Further benefits include professional reception services, secretarial support and a good range of business facilities available onsite. 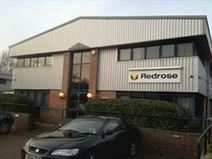 This modern three-storey office building is situated in Watford, just a 10-minute walk to Watford High Street station. The whole second floor is available while there is car parking to the rear of the building for tenants. Watford has excellent places to eat and drink, as well as the intu Watford which boats a range of well-known outlets, including John Lewis, Marks & Spencer and a Tony & Guy salon. 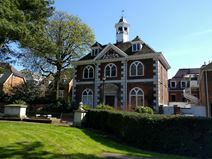 In the heart of the town centre with state-of-art communications this office space is set amongst the tranquillity of St Mary’s Conservation area within a beautiful refurbished 1700's Grade II listed building. Great access to local transport links. There are a range of local amenities, such as cafes, bars and restaurants, as well as the main attractions of Watford. On-site, there are great facilities, and the space is accessible 24-hours a day. Enormous space is available within this excellent modern centre and can lend itself to a variety of uses being comprised of warehouses, studios, light industrial units and more traditional office suites. The exceptional facilities include kitchens, lounge areas, car parking and an in-house café. Not far from central Watford, the area is served by a variety of transport links. Historic business centre in the centre of Watford, providing serviced office accommodation extending to 589 and 612 sq ft of space. Within a minutes walk of Watford High Street station and close to the amenities provided by Watfords Harlequin shopping centre, these attractive offices are offered on flexible, all inclusive terms, minimum one year lease. 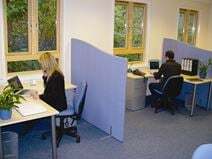 Part of a nationwide network of centres, this property offers quality, furnished office accommodation suitable for small companies and with extensive facilities such as lounge areas, showers and messaging services. The M1 is very close by as are restaurants, a gym and a hotel. Located right next to Watford Junction Station, this new Grade A office space offers high quality flexible accommodation that totals 26,620 sq. ft. across tow floors. Offices are available that can cater for one workstation up to 220 workstations. There are a multitude of on-site amenities, including shower facilities, air conditioning, a reception area, administrative support, conference facilities and printing and copying facilities.